and weak upper back muscles. This muscular imbalance causes our shoulders to slouch forward and creates the climber “hump” in our upper back that so many of us have developed. Not only is this posture detrimental to our spinal health but it can also cause debilitating neck and back pain, poor circulation, fatigue, irregular breathing patterns, and puts unneeded stress on all systems of the body. It’s crucial for our health (and our climbing!) that we counter the muscular imbalances that our sport sometimes creates within our bodies. Look up from that iPhone! Tilting your chin down causes your entire spine to go out of whack. Keep your chin parallel with the ground as much as possible. Is your upper back hunched and your shoulders rounding forward? Instead, draw your shoulders back and down, and broaden your chest by keeping your spine long. Notice the tilt of your pelvis. Make sure that it’s in a neutral position and isn’t causing your lower back to arch or round dramatically. Engage your core muscles and keep your weight evenly distributed over both legs. Find a local class or work with a private instructor. Yoga, when practiced correctly, can teach us about body alignment, strengthen the muscles surrounding our spine and core, and heighten our overall body awareness. These are all very crucial components of good posture. We all know how painful and annoying it can be to constantly have to look up at your climber when you’re giving a catch. Belay glasses let you look forward while belaying, which allows for correct alignment of your head and neck. Belay glasses not only prevent neck injuries, but they help the rest of your spine to fall into correct alignment as well. Our favorite kind of belay glasses are Belāggles. One of the main reasons why climbers have such terrible posture is due to muscle tightness, especially in the chest and lats. 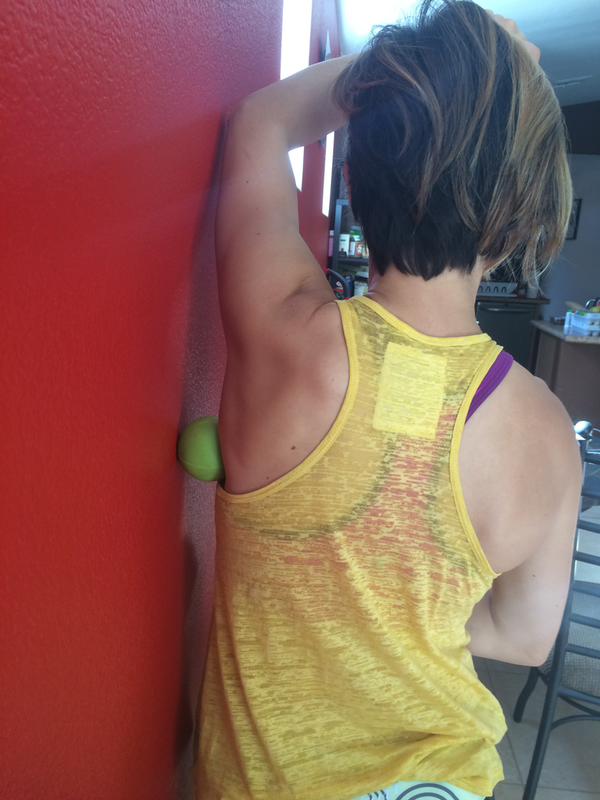 Using a lacrosse ball to target these tight areas can really improve our posture and alignment. If you don’t have a lacrosse ball or find it too intense, you can also use a tennis ball. Face a wall and place the ball in between the wall and your chest. Aim for the area right below your collar bone. Do at least eight back and forth strokes. Stand with one side to the wall. Raise the arm closest to the wall above your head, place the ball between the wall and the area just behind your armpit. Roll out this area, giving extra attention to any spots that feel especially tight. Incorporating these simple tips into your day can dramatically improve your posture and overall wellbeing. Making these practices a habit will also help prevent injuries and ensure that you can climb for the rest of your life!